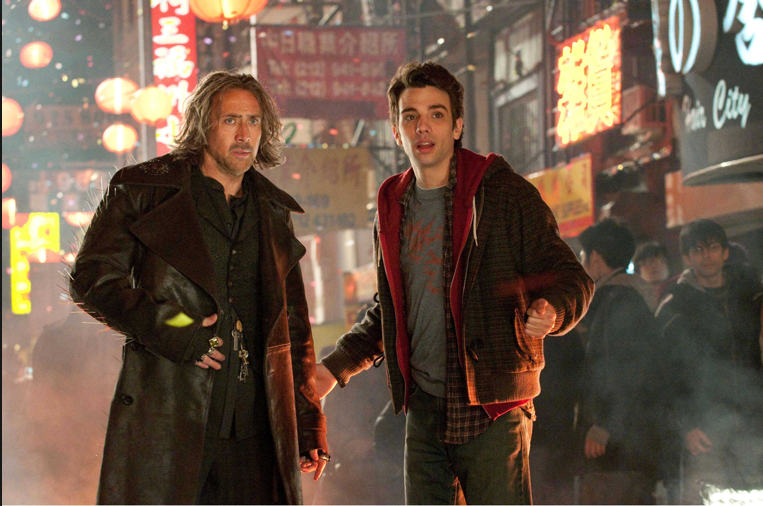 Cage and Baruchel’s costumes are pretty basic here, but look at that nice set design, framing, and SFX! That’s how filmmakers really create magic. Story: Merlin’s apprentices battle for supremacy, until the young and bumbling “chosen one” of the modern age saves the day. . . with science! Review: As much as I dislike Nicholas Cage, this movie was good enough where I could pretty much ignore his naturally obnoxious personality. The real star of the piece was young comedian Jay Baruchel, who played the “chosen” apprentice with excellent comic timing and expert physicality. Aside from that, the dialogue is quite sharp and witty, the plot is lively, and the parody/homage to the original Sorcerer’s Apprentice scene from Fantasia is great! Recommended for: kids/families, science nerds, Disney fans, comedy fans. This entry was posted in Review and tagged acting, Comedy, Disney, Magic, Screenwriting. Bookmark the permalink.